Are you ready? This treasure hunt will take you beyond what you ever imagined when it comes to understanding your health and the answers found in scripture. 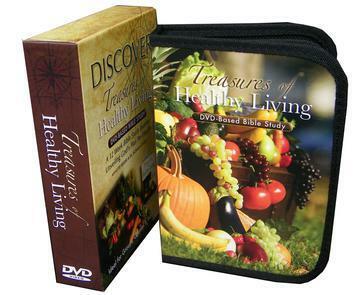 Treasures of Healthy Living is a Bible study designed with you in mind. The DVD series will enhance the Bible study. Thirteen messages on DVD, each video segment varies from 25 minutes to 60 minutes. These videos are perfect for individual study and compliment the Treasures of Healthy Living Bible Study. Buying this DVD collection does not include the book. Topics of interest include: Your Health Bank Account, Inflammation - Is Optional, Understanding Your Blood Tests, Build a Healthy Immune System, Its a Radical Life, We Were Made to Move, Bread, Forgiveness, Plus so much more.